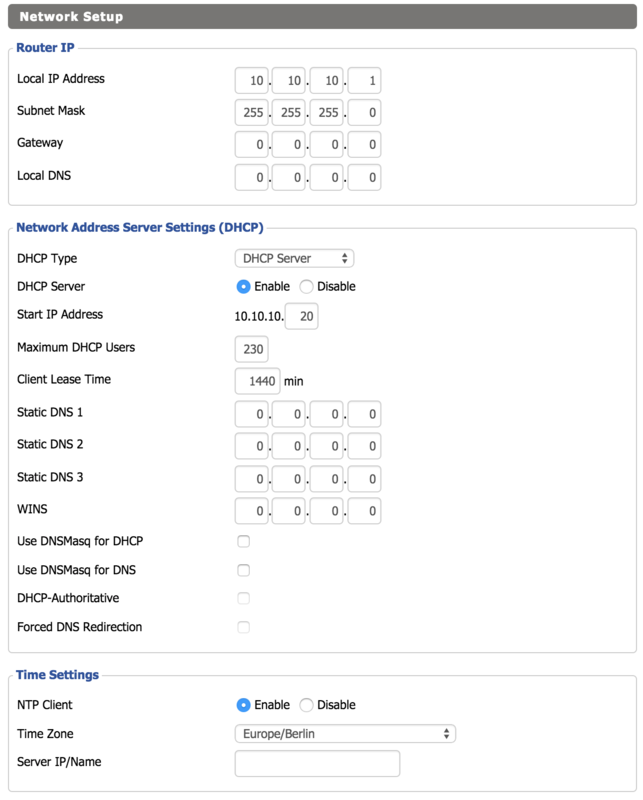 I can't seem to find any documentation on how to set up the DD-WRT router and timing computer to host the private timing network and the public results network. Anybody have a link? I saw the "what to do when the router goes down" thread and picked a few things out of that, but it's above my pay grade and I'm sure I'm missing something important... can't access the system from another device. I was able to get our new Farm Tek talking to RM in short order today... ran a few heats around my living room to test it out. :-) Race America system for sale!! @jeffrGGC Welcome to the forums! I assume you're talking about creating a WiFi network for "admin" only devices vs creating an open one for participants. Let's take a quick step back first. The primary purpose of creating a protected WiFI network for admin devices is simply because of the hardware limitations. It has nothing to do with restricting access to features/etc. WiFi hardware can only take so many active connections (usually between 20-30). When the threshold is hit, connections start dropping. That said, you'll only need to create at most 2 separate WiFi networks (SSIDs) and you'll only need to create the second network when you add separate physical WiFi access points to your network. So that means on your router, you'll only need the admin network. 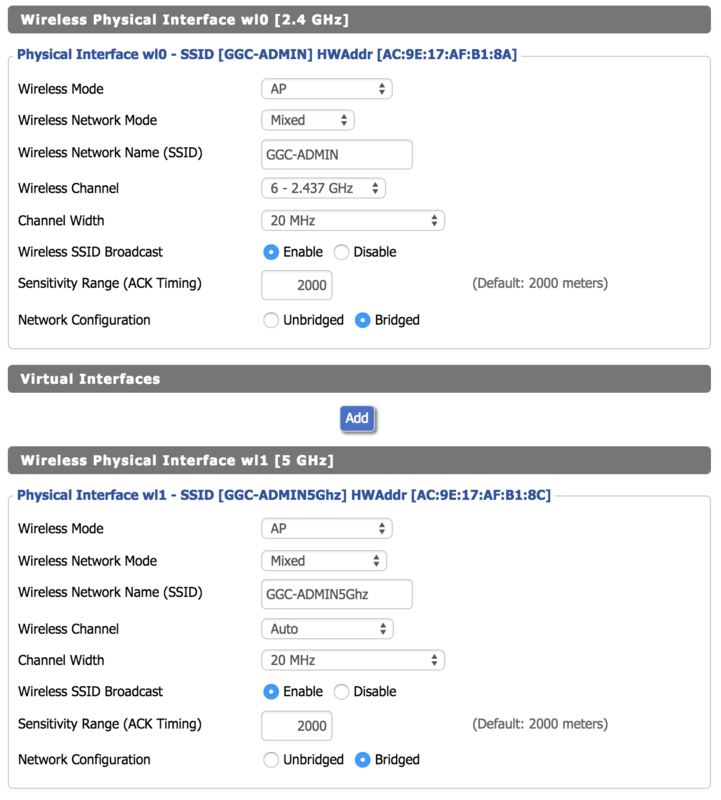 So, is your question about how to configure DD-WRT? What did you try already? Can you take a screen shot of the your settings? Thanks Chris! So glad we decided to go this route! So, right now I have an RT-N66U with DD-WRT on it. I have RM running on the Windows 7 laptop, swimingly I might add. Everything works from that one machne. So, I need to set up the router so the tablets can access the timing laptop for additional roles. Tomorrow I have two Ubiquiti access points showing up, both can support up to four SSIDs and 100+ clients each. 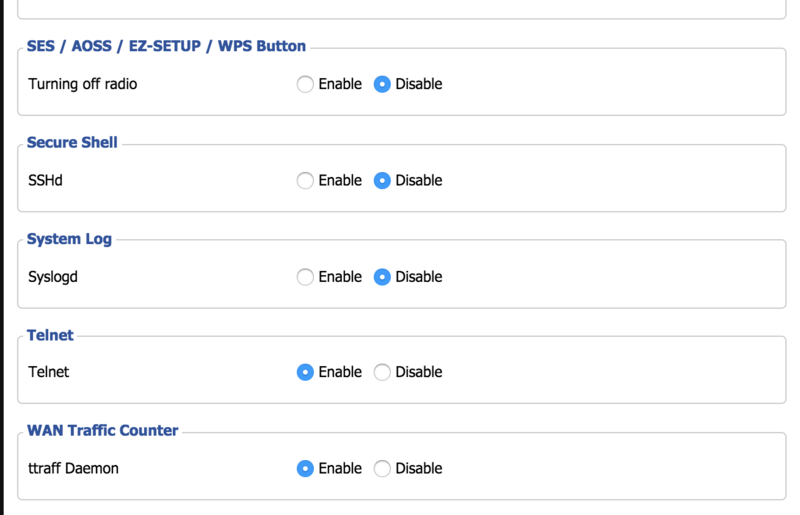 So, it would seem I only need to setup one SSID because we should not have connection limitations. 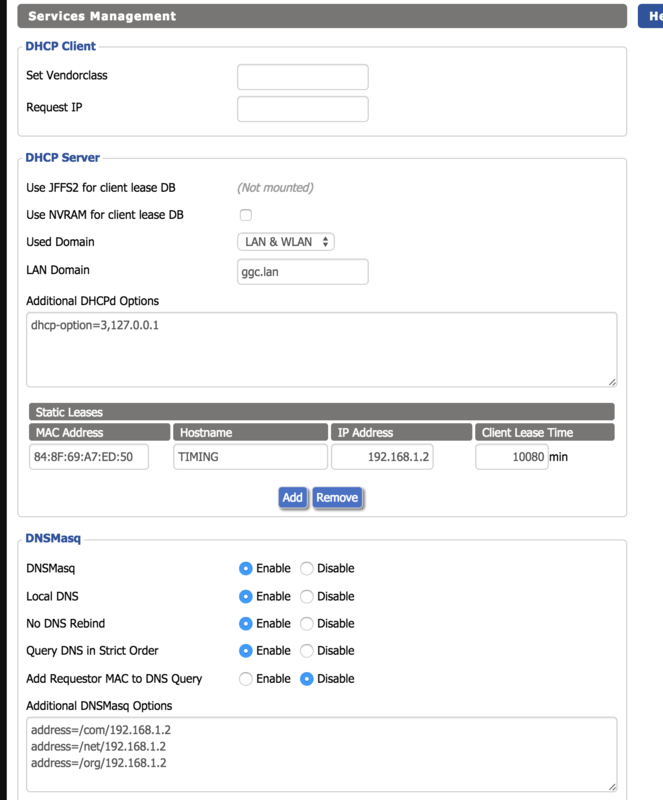 @jeffrGGC First, I'm not a DDwrt expert but perhaps the best I can do is share my config. What exactly is your issue or what are you trying to do that isn't working? Make note the the Client Lease Time is 15 minutes as a default. 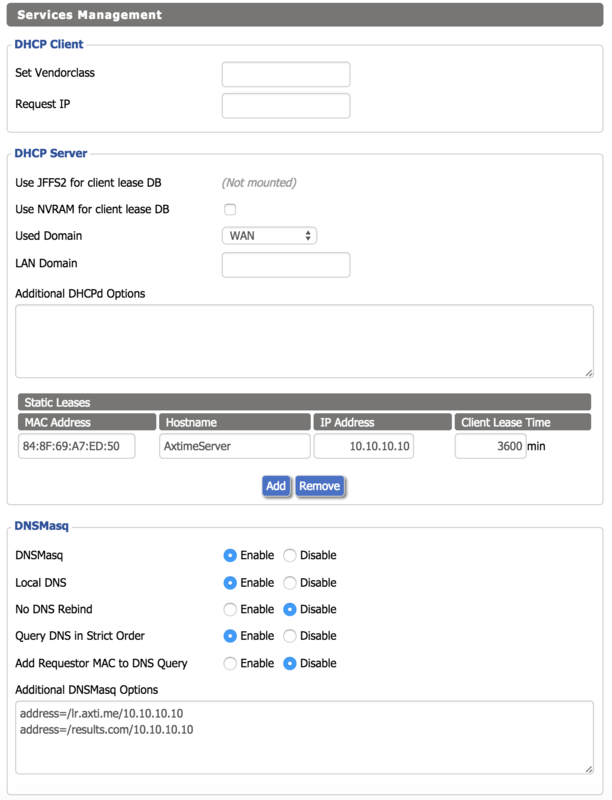 Reset your DHCP Server section. Also correct your DNSMasq settings. Thank you @Chris. I've set my screens to look like yours. I can ping lr.axti.me, results.com, and axtimeserver from another computer on the network... they all resolve to 10.10.10.10. I have axti.me running on the laptop. What I cannot do is access lr.axti.me or results.com from Chrome on another device on the network. I have a Google tablet that is on that network, IP confirmed, but when I try to access lr.axti.me and results.com, I get "the webpage is not available." Do I need to configure IIS on the Win7 machine to point to AXtime? 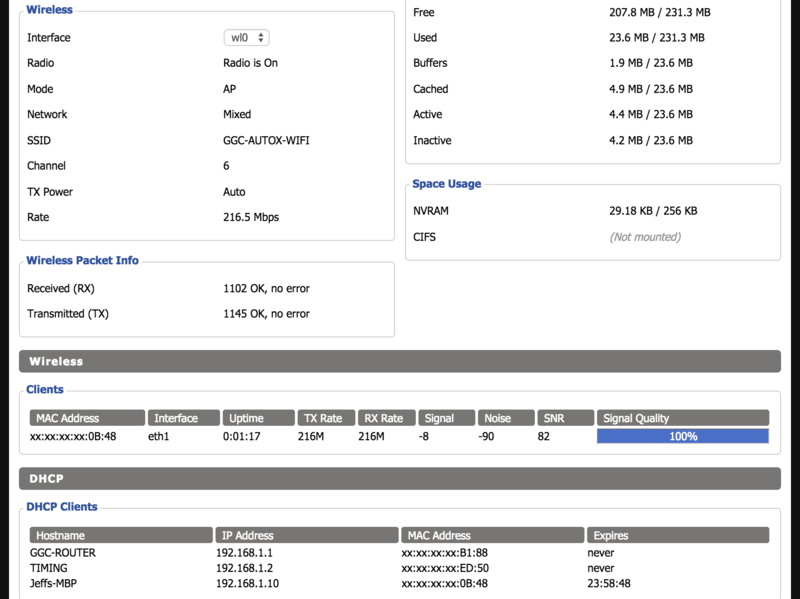 @jeffrGGC Your config's look ok. On the AXtimeServer, can you view AXti.me in Chrome? If so, can you access it via http://10.10.10.10 ? On the server I can access it with 10.10.10.10 but not axti.me. On the tablet I cannot access it at all. @jeffrGGC When you installed AXti.me and started up Step 2 for the first time, did you get a firewall warning from Windows? Sounds like a firewall issue. @Chris no sir, no warnings. I've turned Windows Firewall off. Still can't access it. I have Avast! on there too, also disabled that. Dug a little deeper... this looks right, tho I've turned off Windows Firewall anyway. @jeffrGGC Most likely still a firewall or avast issue, but could be the router. Have you tried disabling the FW / avast and restart? You could also delete the existing evented I/O for V8 entries, restart, enable firewall, restart and fire up AXti.me. Well @Chris, apparently some magic happened by going thru the steps in your last post. It's working! I have Windows Firewall and Avast enabled now, and I can access the server from other devices. The Ubiquiti WAPs arrived today. Very simple to get online and thanks to your screen shots Chris, also simple to add to my network configuration. We are go for launch this weekend at our non-complete event. @jeffrGGC All good to hear! How did you setup the Ubiquitis? I'm glad this thread is here. At Saturday's event, I accidentally plugged the power cord for our PoE injector into the router and popped the router like a soap bubble. I had config files saved for the WAPs but I either lost the one for the router, or I never saved one. Ooooooops.